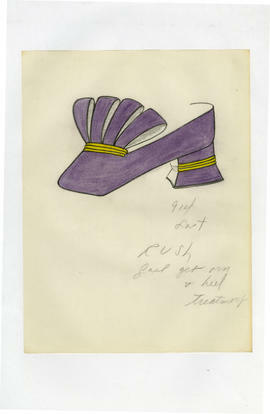 The I.Miller sub-series contains a total of 691 sketches in 4folders, all of which are original color sketches. The specific year information is not available in this subseries, but the year range can be deduced from Arsho Baghsarian’s biography history (she designed for I.Miller from 1963 to 1968). The shoe types in this subseries include sandals, flats, pumps, thongs, and very few boots. Based on the dominant shoe forms contained in this subseries, these sketches should belong to spring and summer seasons. One of the notable characteristic of this subseries is the wide adoption of bulky heels. The element is merged into the design of pumps, pump sandals and flats, which gives this subseries a character of casualness. Additionally, the integration of feminine elements, such as flower and bow ornaments, endues a mixed quality into this subseries.